Renowned artist Kelly Jones returns to the Dark Knight’s world with Batman Kings of Fear #1, the first issue in DC Comics stunning new miniseries written by former Batman editor Scott Peterson. Batman has been watching over Gotham City for many, many years, but now the Dark Knight is beginning to question the effectiveness of his relentless war on crime. Plagued by self doubt, insecurities, and personal fears that threaten to overwhelm him Batman must now face Scarecrow as he unleashes chaos in Arkham Asylum! This blockbusting new six-issue miniseries has Batman confronting the darkest challenge of his crime fighting career and portrays Scarecrow in a terrifying new way that’s unlike anything you’ve ever seen before. Batman Kings of Fear #1 kicks off in a fittingly macabre fashion as Batman takes on the Joker and stops another of his maniacal schemes. Kelly Jones striking visuals and Scott Peterson’s intense storytelling quickly immerses us in the warped schism that Batman and the Joker seem perpetually condemned to play out. Scott Peterson weaves some especially insightful and haunting dialogue into their journey to Arkham Asylum – so much so that the Clown Prince of Crime even seems to jangle the Dark Knight’s nerves at one point. Once inside Arkham the dark humour, a snarky Doctor, and the ensuing breakout of mayhem all collude to ramp up the ominous air of brooding menace that’s been closing in on Batman right from the outset. Kelly Jones illustrated some of the most acclaimed Batman comics imagery during the 1990’s, including the brilliant Batman & Dracula trilogy – which kicked off with Red Rain back in 1991 – and many of the covers for the acclaimed Knightfall storyline where Bane broke the Bat. Esteemed writer Scott Peterson also worked as an editor on the Batman books during Knightfall and many other pivotal Bat-stories from the 90’s. Its great to see Jones and Peterson working together again like this on Batman Kings of Fear, and their shared creative vision for the Dark Knight shines through just as vividly now as when they originally worked together on the Batman books in the 90‘s. 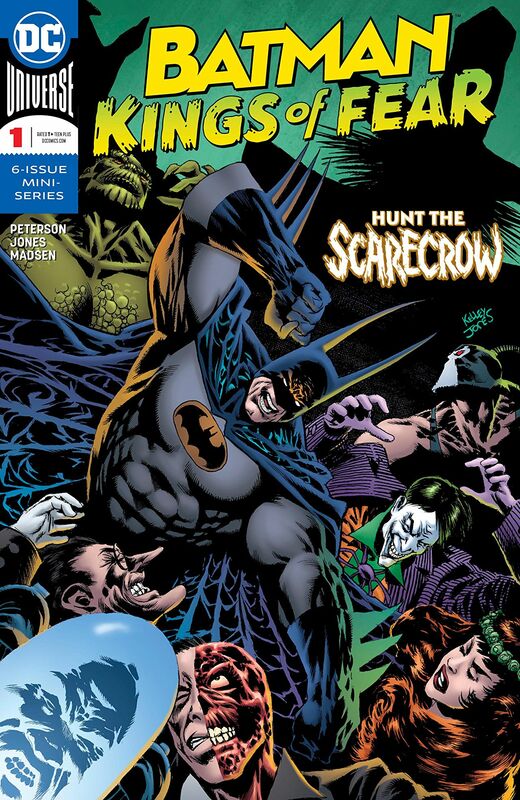 The story in Batman Kings of Fear is not connected to DC Comics current Batman storylines, but is instead set after Bruce has been the Dark Knight for many years – giving the creative team the scope to explore the core facets of the character in new and dynamically exciting ways. Artist Kelly Jones brings all the hallmarks of his distinctly dark, horror-tinged gothic style to Batman Kings of Fear, and then some! I’ve always been a huge fan of Kelly Jones artwork, especially Jones’ portrayal of Batman as a constantly shifting shape that always seamlessly blends in with the shadows. One of the major highlights in this issue is a face-off with some of the darkest members of Batman Rogues Galley – a truly jaw dropping sequence that places you right in the heart of Batman‘s nightmarish predicament. Another nice touch with Batman Kings of Fear is that it features the Dark Knight in his classic costume – yellow oval and all! I love how Kelly Jones always renders Batman’s billowing cape in a way that gives him an almost supernatural visage, effectively making the cape and cowl as equally a distinct character in its own right. It is this, together with Michelle Madsen’s gloriously sombre color pallet that perfectly encapsulates the raw, terrifying, almost primal presence that makes Batman so uniquely special and intimidating. The greatest threat though comes from the Scarecrow’s terrifying plot against him. Jones and Peterson’s darkly compelling story is made even more striking by having Scarecrow as the major villain of the piece, and this creative team certainly don’t look like they will shy away from brining the most frightening aspects of this creepy iconic character from Batman’s rogues gallery to the fore either. Batman Kings of Fear #1 hurtles along at a cracking pace, the eerie atmosphere is brilliantly offsets by the spectacular visuals, and the chilling cliff-hanger rounds off this start of this superb miniseries in fine style. Kelly Jones and Scott Peterson have certainly crafted a brilliant premise here, with Scarecrow seeking to make the Dark Knight face his greatest fear, and I’ve no doubt the creative team will continue to weave their dark magic as this story unfolds. If you like your Batman classic, unburdened by recent continuity, and laced with overtones of gothic horror then Batman Kings of Fear is the Bat-Book you’ve been waiting for!